What is strange is that such residential mortgages were pooled, tranched with some AAA-ratings, and sold to sophisticated investors globally. True, Fanne and Freddie were buying, but but the housing paex they were running second to private-sector buyers (I think Fannie and Freddie should be phased out, along with the home mortgage tax deduction). Meanwhile, the same or wrose was happening in commercial mortgages and the CMBS market--except here, there was no federal involvement at all. At the property apex, lenders were bragging how high they could go "in the capital stack," with one lending arm giving a 80 percent loan-to-value, and other arms getting you close to 100 percent. Again, a buyer could line up a deal with little equity. Though the mainstream media blah-blah is about residential real estate, in fact the commercial bust was equal or worse. Office building in Newport Beach area of CA are selling for one-half of peaks. One more note: The "entire financial crisis" had many actors, including Fannie/Freddie, credit ratings agencies, investment banker-underwriters, and "sophisticated" buyers willing to buy CMBS and RMBS. The fact that the commercial real estate market also busted suggests basic underlying factor, including a general economic slowdown. But the fun story is to blame a lot of urban darkies for torpedoing the global economy. I kinda like that story. See that guy in the undershirt and baggy pants? He nearly wrecked half the Swiss bankers in the world. "But the fun story is to blame a lot of urban darkies for torpedoing the global economy." -- "Benji"
That's it, isn't it? When it comes right down to it, screaming "racism" is all you lefty filth really have. When you've reached the end of your intellectual tether, you simply bark out vicious nonsense. Pathetic. Still- in spite of this - when you think about it, amortization basically means that you start out at the beginning of your 30 year loan paying, what a thousand percent interest? I may have exaggerated there, but maybe not- I'm no math whiz. But I know that on an amortized loan the interest rate from years 15-30 is INCREDIBLY HIGH. So, what do the banks do with all that money? Because they all got TARP money in 2008. And tons of banks failed. So- who got rich off the amortized interest rates? Add to that - the average home 30 year home loan only really lasts for 7 years. So the borrower never even reaches the even money point. Amortization should be outlawed. Banker greed IS part of the equation but there are plenty of other shenanigans that caused the crisis too. Okay, maybe not so brilliant, I meant years 1-15. It's an entertaining story, but if you tell me that investment banks decided to lever up 50:1 or more because the government forced them to, it won't help me take the information discussed here more seriously. I sat through an investor meeting where the exact same chart (minus the future years of poor performance) was used to justify the success of CDOs and other financial engineering to sell more of it. Now, see, I love that the idiot clowns prancing around The Swamp can't repeal the iron laws of economics. It's always good to know there's something I can rely on. You were correct in your second post. Not brilliant at all. In fact, kinda clueless. No bank was levered 50:1. Not a single one. If you do the accounting correctly, not a single bank was levered more than about 15 or 20:1. The media did some back of the envelope accounting and that's what was repeated all over every outlet. It's incorrect. Of course, their leverage increased as the "assets" (emphases on the first syllable) they held collapsed. But, that's not what you're talking about. Moreover, large amounts of leverage are safe for some things and less safe for others. For instance, I challenge you to find a single clearing firm willing to offer more than 6:1 leverage for a firm engaged in a long/short strategy. On the other hand, 20 or 30:1 leverage is perfectly normal and safe for an equity options market maker. The problem with the banks wasn't leverage as much as it was loading up on complete trash. And as long as we're on the subject of trash, there's nothing particularly wrong with CDO's per se. A CDO is simply a pass through (as are CMOs and other ABS that have been around for decades). The real problem with CDO's is that nobody knew what was in them. Often, the underlying portfolios of cash flows would change periodically. So, even if you tried, you couldn't figure out what you were holding at any given time. Even more complicated were CDO's of CDO's. This begs the obvious question: if nobody knew what was in those things, why the hell were they so eager to buy them? I don't buy mystery meat for my portfolio and I'll bet you don't either. Leverage wasn't the problem. Lack of standards was. They piled on and levered trash topped with rotted garbage. That mess wasn't fit to hold with Reg T leverage. And why should they be worried about standards when they know they'll reap all the rewards and be bailed out by taxpayers when the poo hits the fan and the world will polarize, as it has now, into Too Big To Fail and Too Small To Succeed? After all, they're political cronies and taxpayers are nobodies. Branigan if you outlaw amortization(compound interest is what we think you mean)what would be the simple interest rate? Would you also outlaw life insurance companies from paying compound interest? Doesn't anyone read Jeremy Bentham anymore? I obtained a mortgage with a 3% down payment. The return on that initial 3% investment far exceeded the return on any other investment I've ever made. That being said, I am opposed to allowing 3% down payments as long as there is even a remote chance of a Federal bailout. The left is good at that as is the right. They scream racism while the right blames the left even though its supposedly 'conservative' administration was pushing most of the same goals as Clinton. By the time they figured it out there was no political currency to fix the problem and the bus was allowed to drive over the cliff. This is why both parties have to go. current state of the economy. I don't think your graph explains anything. It's just a prop for a dead ideology. Why WOULD bankers makes such bad loans before the crash when, as you say, they would have laughed you out of the office in the past? Are you gonna claim ALL those loans were forced to be made by Uncle Sam? So Canada doesn't have 5% down mortgages? No matter what the down payment, almost all loans in Canada are full recourse-a reason to think twice about defaulting on your loan or taking it on in the first place. You write: "But I know that on an amortized loan the interest rate from years 15-30 is INCREDIBLY HIGH." The usual home loan payment is set to be constant over the term of the loan, because it is simpler for the buyer to make the same payment each month. On a $100,000, 20 year loan at 7% (240 months) the monthly payment is $775. Of the first payment, $583 is interest and $192 goes to pay off the principal. The borrower buys back $192 of the loan in the first month. The interest rate is 7%/12 of the outstanding loan balance in every month of the loan. In the last year of the loan, most of the monthly payment goes toward buying back the loan, as there is only a small loan balance outstanding after 19 years. The result of the lax lending requirements has destroyed the housing market for everyone. I put down 20% in 2002. While I'm "above water" I'll get nowhere near what I need for my home if I should try to sell it. There are a great many people who are "underwater" but still dutifully making payments. We're all "tied to our land." Where was the last time you heard that term? Feudal Europe? They're turning us into serfs! Soon we'll depend on the "crown" to provide us with our health care... a gift at first glance, but tool to wield over us and use as leverage. It has to do with incentives. If you were a banker it was perfectly rational to take part in the bubble and get paid huge amounts of money because the personal gain was so high and you were not using your own money. Your firm had easy access to funds thanks to a compliant Fed and as long as the loans could be packaged off and sold to suckers the game was very profitable. Of course it does. 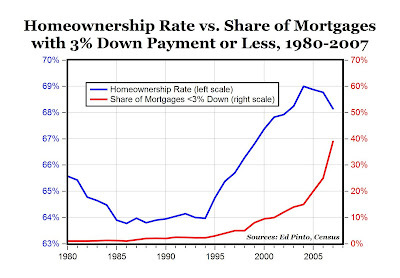 But the mortgages have to be insured by the taxpayer and the rate is higher. The fact that Canada has such loose standards is one of the reasons why it has such a large housing bubble. Crappy loans don't get made if they can't be turned into MBS and CDS and CDO's.... that only occurred because Wall Street sent armies of lobbyist to the hillNINE times to finally defeat Glass Steagal. The answer, of course, is that it was government policy for these poor quality loans to be made. 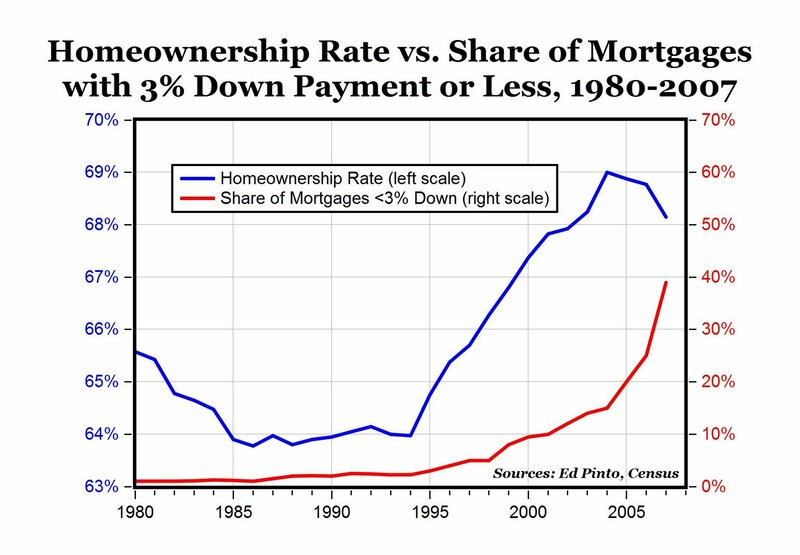 Since the early 1990s, the government has been attempting to expand home ownership in full disregard of the prudent lending principles that had previously governed the U.S. mortgage market. Now the motives of the GSEs fall into place. Fannie and Freddie were subject to "affordable housing" regulations, issued by the Department of Housing and Urban Development (HUD), which required them to buy mortgages made to home buyers who were at or below the median income. This quota began at 30% of all purchases in the early 1990s, and was gradually ratcheted up until it called for 55% of all mortgage purchases to be "affordable" in 2007, including 25% that had to be made to low-income home buyers. It was not easy to find candidates for traditional mortgages—loans to people with good credit records or the resources for a substantial downpayment—among home buyers who qualified under HUD's guidelines. To meet their affordable housing requirements, therefore, Fannie and Freddie reduced their lending standards and reached into the FHA's turf. The FHA, although it lost market share, continued to guarantee what it could, adding to the demand that the unregulated mortgage brokers filled. If they were engaged in predatory lending, it was ultimately driven by the government's own requirements. The mortgages that resulted are now problem loans for the GSEs, the FHA and the big banks that were required to make them in order to burnish their CRA credentials. Ah yes, to be replaced by the one true, pure party. This is exactly the kind of argument against democratic government made hy Hitler, Stalin and other dictators - both parties are the same, there is no real choice. In the US, this kind of "everybody does it" argument is often made by the left when they've been discovered in some malfeasance. Always in an effort to diffuse public anger and protect their claim to power. You mention Canada, but you left out an important philosophical difference between Canada and the U.S. Canada doesn't allow a mortgage interest deduction on personal taxes like the U.S. does. "One solution that offers a potential compromise would be to cap the [deduction] so that homeowners can deduct up to the first $7,000 of interest they pay each year, then not allow any deductions above that amount. ... It is alleged that this will make a substantial dent in the Federal Budget Deficit, allow low-income and moderate-income homeowners to keep their full deduction (for principal amounts under $140,000), and allow wealthier homeowners to keep part of their tax break." One thing seldom mentioned in this discussion is that most saving institution DEPOSITORS were in a risk free situation, so they didn't care how risky the loans were. SIPC, FSLIC, etc. absolve the depositor of any concerns as to the risk of lending, or even the viability of the bank. As I recall, in the 1970's the government changed the $10,000 FDIC et al insurance to $20K. Quickly that rose to $40K, and then $100K. I would think that was a factor in the resulting savings and loan bust of the 1980's (tiny compared to today's mess). Nonsense. The Left & Right have a lot in common with Hitler & Stalin and are the enemies of liberty. You need respect for liberty. Everyone does not do it. The major parties do. The more government interferes the worse the economy gets. They've fouled housing, food, energy, medicine, education, and retirement savings. The six largest househould expenses (omitting transportation, sort of). The vote-buying apparatus in DC is ruining our future. Governments utterly dominate economic activity, eating up 60% of GDP through their spending and regulation. Missing from this discussion are the seven layers of fake federal regulators. Thank them too.